Ethics amendment supporters gather on the State Capitol steps in Bismarck. Members of the group “North Dakotans for Public Integrity” submitted petitions Monday to place what the group calls the "Anti-Corruption Amendment" to the state Constitution on the November ballot. The group needed 26,904 valid signatures to get the measure on the ballot. 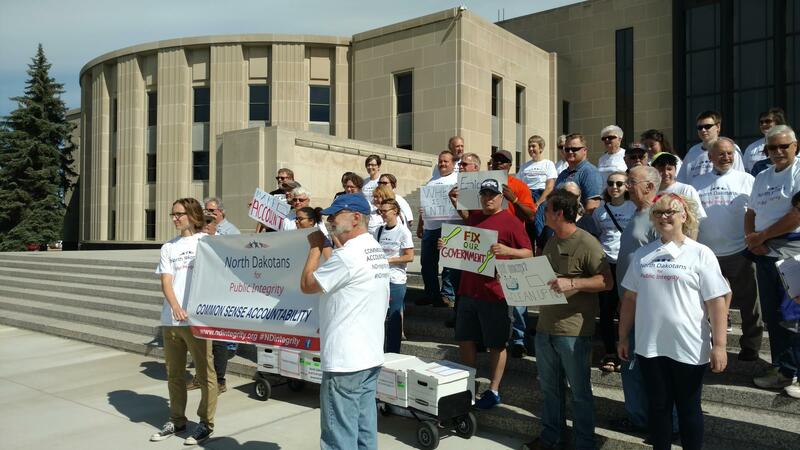 "I'm honored to announce that over 38,000 petitioners are on the record to place the North Dakota Anti-Corruption amendment on the November ballot," the group's co-chair, Ellen Chaffee, told a rally on the state Capitol steps in Bismarck. The petitions were taken to Secretary of State Al Jaeger, who will review them. Co-chair Dina Butcher said once the petitions are okayed, and the measure is approved for the November ballot, the work begins to get the measure passed. "We're going to run a campaign," Butcher said. "It will be an educational campaign." Butcher said a poll was done earlier on the concept of an ethics commission. "We had 70 percent of the population that agrees with us on the need for this kind of enshrinement into the Constitution," Butcher said. In the past, efforts to create a state ethics commission failed in the state Legislature. The state House has turned down a proposed Constitutional amendment that – if voters would approve – would create a state ethics commission. If it were okayed at the ballot box, the 2017 Legislature would have written the rules for the commission. Opponents say the state doesn't need it.